Internet idea now on trial across city. 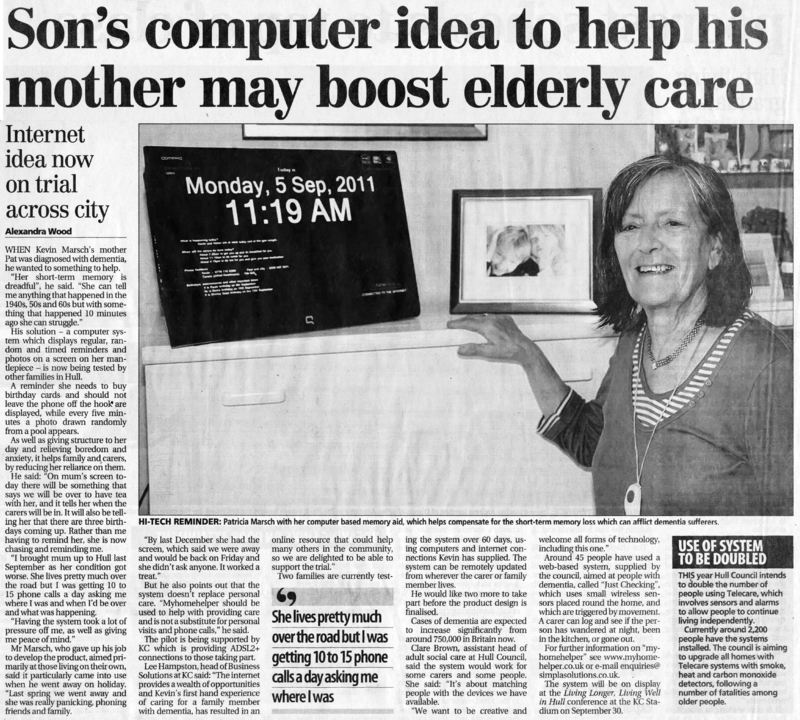 myhomehelper creator, Kevin Marsch, was interviewed by Alexandra Wood of the Yorkshire Post in September 2012. Click here to see the original article as it originally appeared. When Kevin Marsch's mother Pat was diagnosed with dementia he wanted to do something to help. "Her short term memory is dreadful", he said. "She can tell me anything that happened in the 1940s, 50s and 60s but with something that happened 10 minutes ago she can struggle." His solution - a computer system which displays regular, random and timed reminders and photos on a screen on her mantlepiece - is now being tested by other families in Hull. A reminder she needs to buy birthday cards and should not leave the phone off the hook are displayed, while every five minutes a photo drawn randomly from a pool appears. As well as giving structure to her day and relieving boredom and anxiety, it helps family and carers by reducing her reliance on them. He said: "On mum's screen today there will be something that says we will be over to have tea with her, and it tells her when the carers wil be in. It will also be telling her that there are three birthdays coming up. Rather than me having to remind her, she is now chasing and reminding me. "I bought mum up to Hull last September as her condition got worse. She lives pretty much over the road but I was getting 10 to 15 phone calls a day asking me where I was and when I'd be over and what was happening. "Having the system took a lot of pressure off me, as well as giving me peace of mind." Mr Marsch, who gave up his job to develp the product, aimed primarily at those living on their own, said it particularly came into use when he went away on holiday. "Last Spring we went away and she was really panicking, phoning friends and family. "By last December she had the screen, which said we were away and would be back on Friday and she didn't ask anyone. It worked a treat." The pilot is being supported by KC which is providing ADSL2+ connections to those taking part. Lee Hamptson, head of Business Solutions at KC said: "The internet provides a wealth of opportunities and Kevin's first hand experience of caring for a family member with dementia, has resulted in an online resource that could help many other in the commnuity, so we are delighted to be able to support the trial." Two families are curretnly testing the system over 60 days, using computers and internet connections Kevin has supplied. The system can be remotely updated from wherever the carer or family member lives. He would like two more to take part before the product design is finalised. Cases of dementia are expected to increases significantly from around 750,000 in Britain now. "We want to be creative and welcome all forms of technology including this one." Around 45 people have used a web-based system, supplied by the council, aimed at people with dementia called "Just Checking", which uses small wireless sensors round the home and which are triggered by movement. A carer can log and see if the person has wandered at night, been in the kitchen, or gone out. For futher information on "myhomehelper" see www.myhomehelper.co.uk or e-mail info@myhomehelper.co.uk. The system will be on dispaly at the Living Longer, Living Well in Hull conference at the KC Stadium on September 30, 2012.